We are dedicated to solving the problem of poor compliance. 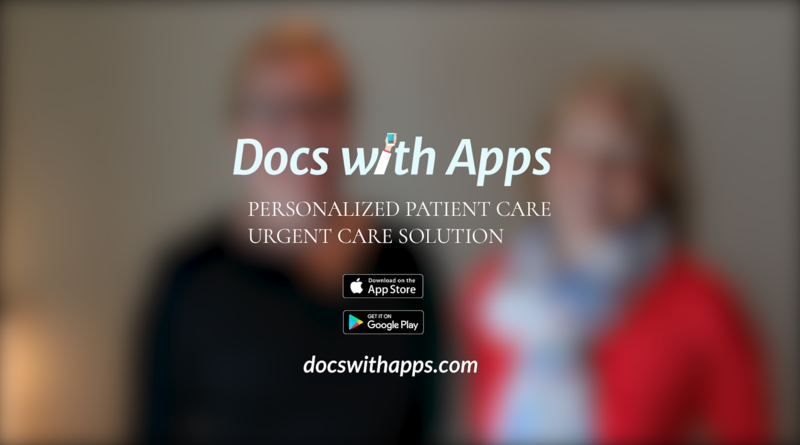 At Docs With Apps, our mission is to give you the tools you need to provide a new level of personalized care for your patients. Care that extends beyond the four walls of your office. Who is Docs With Apps? 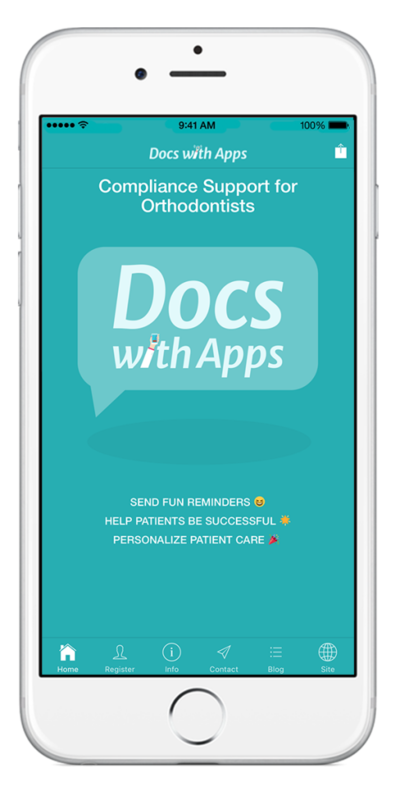 Docs With Apps was founded by an orthodontist, a designer, and a developer, making us uniquely qualified to address your needs. Is Docs With Apps a “Cookie-cutter” Product that anybody can Download? NO! 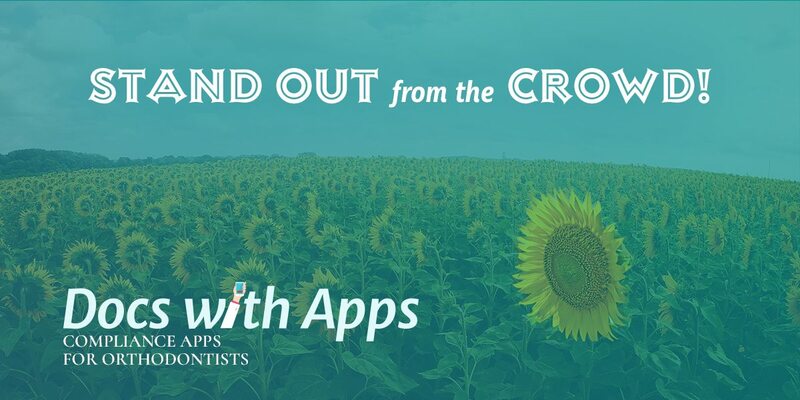 Docs With Apps will design a customized app especially for YOU and YOUR practice that is fully branded with your practice name and logos to coordinate with your website and practice materials. Your patients will be able to download your app from the App Store & Google Play. What Will My Very Own App Do? Compliance: Offer support to your elastic wearing patients by providing them with four fun reminders throughout the day. Help your patients help themselves by supporting them as they form this new habit. Make compliance fun by allowing your patients to earn badges which demonstrate good elastic wear. Patients can request elastics directly through the app. Urgent Care: The on call doctor or staff member can now be contacted directly through the app. No more phone calls on personal cell phones. No more telephone tag. Photo sharing allows immediate assessment of the patient’s concern. What Other Features Should I be Aware Of? Two-way Text: Direct communication is possible through the app between doctor and patient, as well as between doctor and a group of patients. Website Access: A direct link is provided to your website through the app. Blog: A direct link is provided to your blog content through the app. You are leveraging the newest technology available to provide your patients with a new level of personalized care. You are showing that you are committed to providing your patients with the very best. You are setting yourself apart from the competition. Here at Docs With Apps, we are excited to announce some new features that will be coming to your custom app in 2018. We have already created a way for you to develop a Compliance Program for your practice, now we are adding a Badge Incentive Program, to take compliance to the next level, as well as, Two-Way Direct Messaging and Camera functions to add an Urgent Care Program for you as well. We know how difficult it is for patients to develop new habits, like elastic wear, so to combat this, Docs With Apps developed a Push Notification Program to help your patients help themselves. 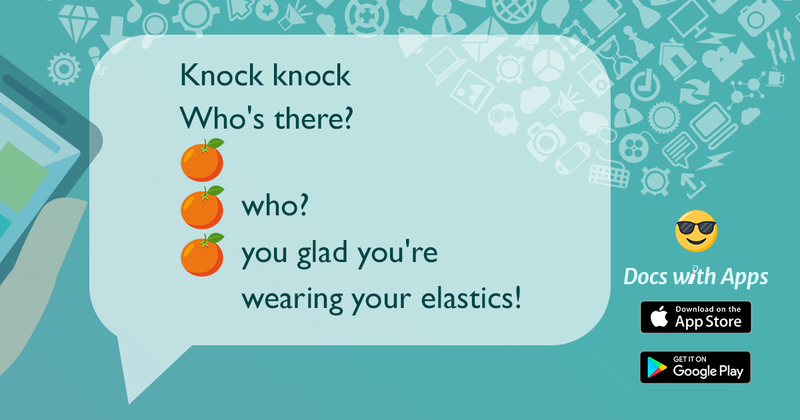 By sending four fun notifications daily from your customized app, you are helping them remember to change and replace their elastics. The new Badge Incentive Program will take that Compliance Program to the next level. Sometimes reminders may not be enough. Now your patients can earn badges for good compliance, making them more engaged in the compliance process. They earn rewards for good behavior. That’s a win-win. Let us help you develop an Urgent Care Program through your customized app. Now the patient can direct message you through the app, send a photo along with it, and you can direct message them a response. Simple. Problem resolved with a few clicks. No more telephone tag. No more wondering exactly what issue the patient is trying to describe. No more undue anxiety on the patient’s part. Another win-win! It is going to be a very good new year! will receive the upgrade at no additional cost. We will develop a customized compliance app for you to provide to your patients. They are attached to their phones 24/7… why not take advantage of that? By providing your patients with your branded app, you are helping them with compliance, while at the same time, making them responsible for it. Docs With Apps will build a customized compliance app complete with your logo and branding. Your patients go to the app stores, download it onto their phones, accept notifications, and the app does the rest. Four times each day, your patients will receive fun, yes I said fun, reminders to wear, replace, and change their elastics. You and your team have done the hard part, educating the patient and their parents about the importance of elastics to the success of their treatment, now let your app take over. Now you are able to support and encourage your patients when they are away from your office. Ready to help your patients get their braces off faster? We cannot say enough about what a wonderful experience it was to attend this year’s NESO Meeting as sponsors. The best part was being able to put faces with the names of so many of you that we have already “met” online, as well as the opportunity to meet your teams, and show you in person, what a customized compliance app could mean to your practice. 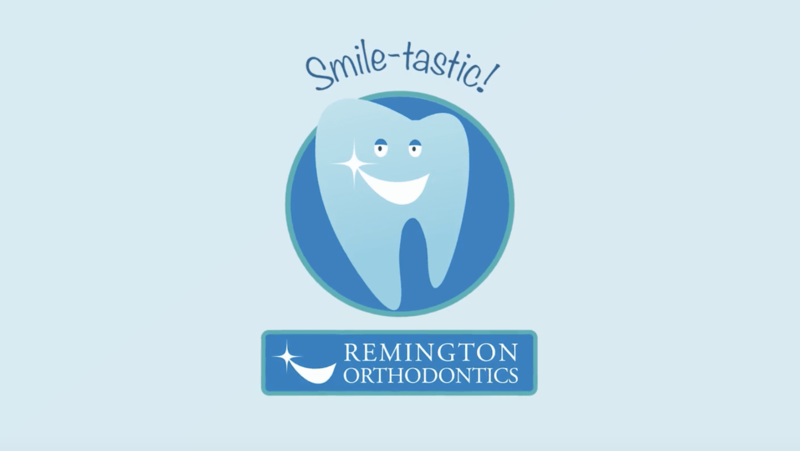 If you haven’t done so already, we would recommend that you download either Dr. Remington’s Smile-tastic! app or our Docs With Apps app from the App Store, give it a test drive, and contact us to have us build one especially for you. It all begins with a customized app! NESO Meeting Here We Come! 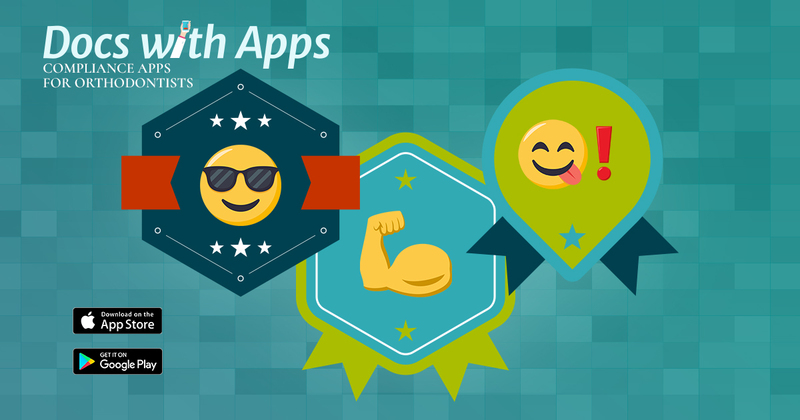 Docs With Apps has so much exciting news to share! We have developed a Docs With Apps app! We want to give each and every one of you the opportunity to experience what it would be like to have a customized app of your own. Download it today, give it a test drive, and let us know how we can help you develop a compliance program for your practice. We are sponsors of the NESO Meeting in Boston this year! We will be there to answer your questions about our services by splitting our time between the exhibit hall and the lecture halls. You will recognize us by the Docs With Apps buttons we’ll be wearing and the dark chocolate we’ll be passing out! → We are holding a prize drawing! Look inside your goody bags at registration for our Docs With Apps card. Fill out the entry form and get it to us for a chance to win an Apple Watch and an iPad Mini! A drawing will be held on both Friday and Saturday during the afternoon Break with Exhibitors. 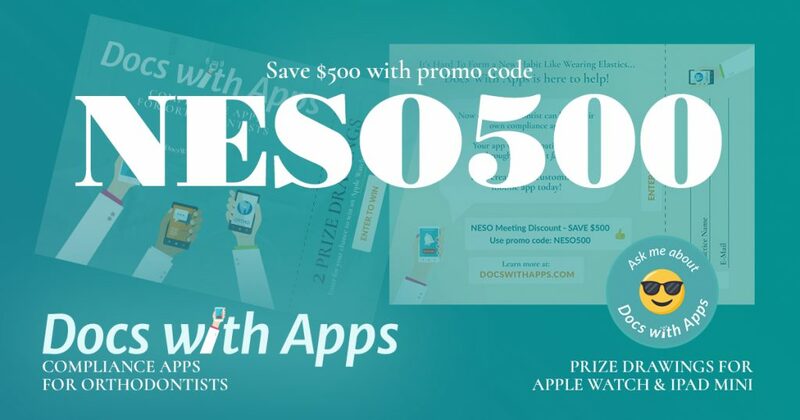 And last, but certainly not least, we are offering a $500 savings on the set up fee as a NESO meeting special. If you will not be attending this year’s meeting, use promo code NESO500 online to receive the special meeting pricing. It will be valid for 30 days following the meeting. We look forward to meeting each of you, and your teams, at the meeting. Please take advantage of our presence there to pick our brains about the benefits of having a customized app and a compliance program for your practice. 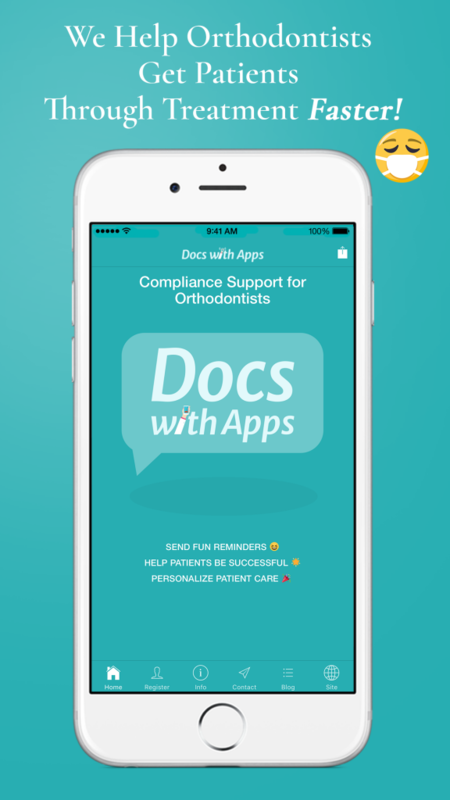 The Docs With Apps APP for Orthodontists! Here at Docs With Apps, we have some very exciting news to share! We have developed another app! 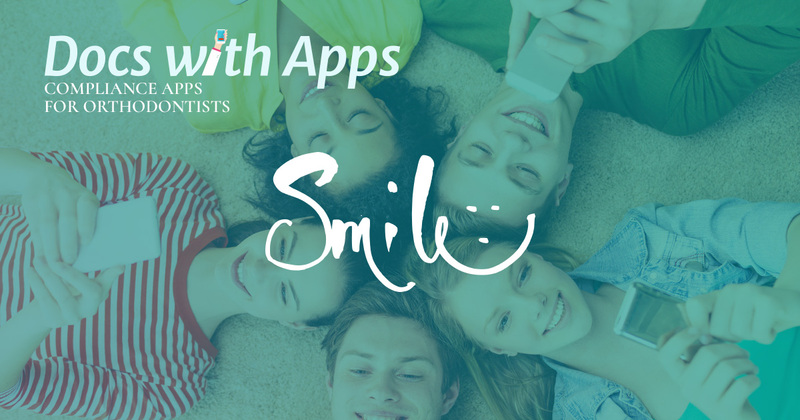 Now in addition to Smile-tastic!, which was developed for Dr. Remington’s practice, we also have the very appropriately named… Docs With Apps – Google Play & Apple Store. 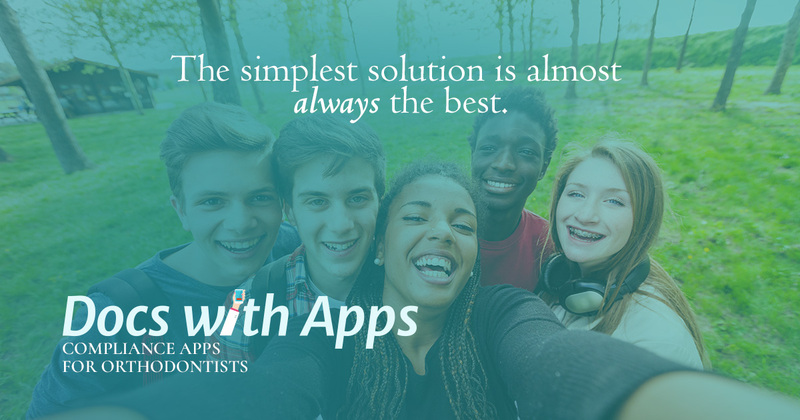 It is important to us, that each of you has the opportunity to see for yourselves, what a tremendous benefit, having a customized orthodontic compliance app can be for your practice. What are the features of your compliance app? 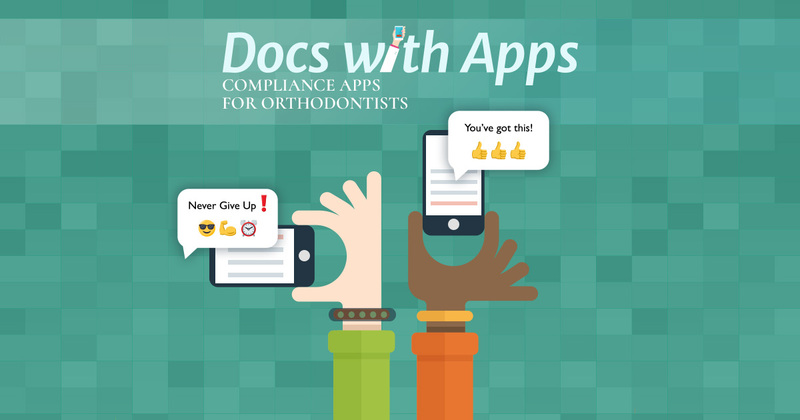 What are the benefits of having a customized orthodontic compliance app? Docs With Apps is a company that you can rely on to have your best interests at heart. We are a developer, a designer, and an orthodontist. We have the knowledge and the experience needed to personalize an app for you and your practice, and provide the support and updates that are required to keep it functioning at peak capacity for the life of your practice. Let’s face it, without patient compliance, we are doomed… is that overstating it??? Maybe, maybe not… Class II malocclusion is everywhere. There are many removable, banded, bonded, and surgical options available for correction. Many of which we try, give up on, and try again. If there was a perfect solution, we would all be doing it! When it comes right down to it, I believe that the simplest solution is often the best. This brings me straight to elastic wear… in a compliant patient (we have those, right?) this is a simple and straightforward solution… noncompliance, however, puts a whole new spin on it. In an article in the July 2017 AJO-DO, a systemic review was done of patient compliance with removable appliances, including elastics. The authors concur that compliance can have a significant impact on both the short and long term success of orthodontic treatment. The primary focus of the review was to evaluate compliance with removable appliances, and secondly to evaluate the effectiveness of the methods used to improve compliance. The most interesting finding in the studies reviewed, is the fact that the difference in measured wear versus reported wear was 5-6 hours! In other words, patients who reported 12 hours of wear, were more likely to have gotten 6 hours. Half of what was reported! These same patients were unlikely to be influenced by the argument that if elastic wear is improved, treatment will be completed faster. One that I must admit to using routinely. Why do patients respond this way, even when they were aware that the time of wear was being objectively recorded? The authors conclude that is it simply an effort to try to please their orthodontist and avoid negative feedback. How Can Your Orthodontic Practice Stand Out From the Competition Online? Does it say what you want it to? Does it attract new viewers? Does it make them want to become patients? If you answered no to any of these questions, let’s see what we can do to change that. The answers we provide here will center both on the technical and content driven aspects of web design to make your orthodontic practice stand out from the crowd! Q: Is your web presence up-to-date? A: If you haven’t updated your website within the last 3-5 years, the answer is no. Being up-to-date is what allows search engines to “find” you, rate your content, and rank you high in the search results. Your goal is to be on the first page of any search. It doesn’t matter how good you are if your potential patients can’t find you in an online search. You only get one opportunity to make a good first impression. Q: Does your site have a responsive design? A: A responsive design is one that allows your site to perform optimally no matter what device it is being viewed on. Our Docs With Apps site was designed with this feature. You can view it on any device/screen size and it will be optimized for the best viewing experience. There is nothing worse than going to view a website on your phone that only shows a part of the page you are looking for. Q: Does your site have a patient portal? A: A patient portal allows your patients to easily manage their orthodontic treatment, appointment, and financial information in a HIPAA compliant environment directly from your website. Your physical office may be closed, but your online office is open for business 24/7. Patient convenience is your number one priority. Q: Is your site compliant with the updated Web Content Accessibility Guidelines 2.0? A: WCAG 2.0 provides information on how to make web content more accessible to people with disabilities. It focuses on four areas of concentration: 1) Perception, 2) Operation, 3) Understanding, and 4) Compatibility. The need to address this issue was raised in “Court: Business violated Americans with Disabilities Act with inaccessible website” in the June 23, 2017 edition of the ADA News. Q: Is your site welcoming? A: Prospective patients decide whether or not they will like you and your team before they have even met you. Your site is your representative online. Make sure it is a good one and that it sets the tone for what each person can expect when they seek treatment at your office. Q: Do you have your own customized compliance app to help patients personally with their elastic wear? A: That is our raison d’etre here at Docs With Apps! If you are looking for a way to stand out from your competition, look no further. 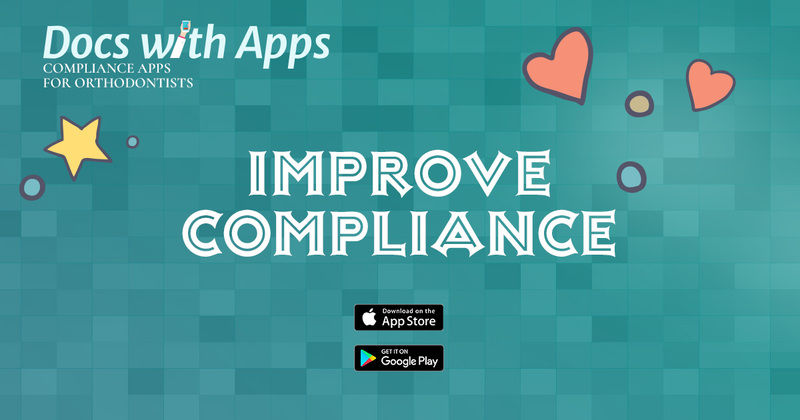 A customized compliance app tells your patients that you put them first, by having an app designed to help them with elastic compliance. Q: Now that you have the app, do you have a video on your website announcing this fantastic innovation? A: Yep! Docs With Apps does that too! Below you see the video that was developed for my Smile-tastic! App. It is front and center on my website for all to see! While these lists are certainly not exhaustive, any changes made to your site that fall in line with these recommendations will certainly boost your online presence by being technologically at the top of your game, while at the same time, offering content that will blow your competition out of the water. Docs With Apps is here to help! Let us make you that practice that everyone is buzzing about!